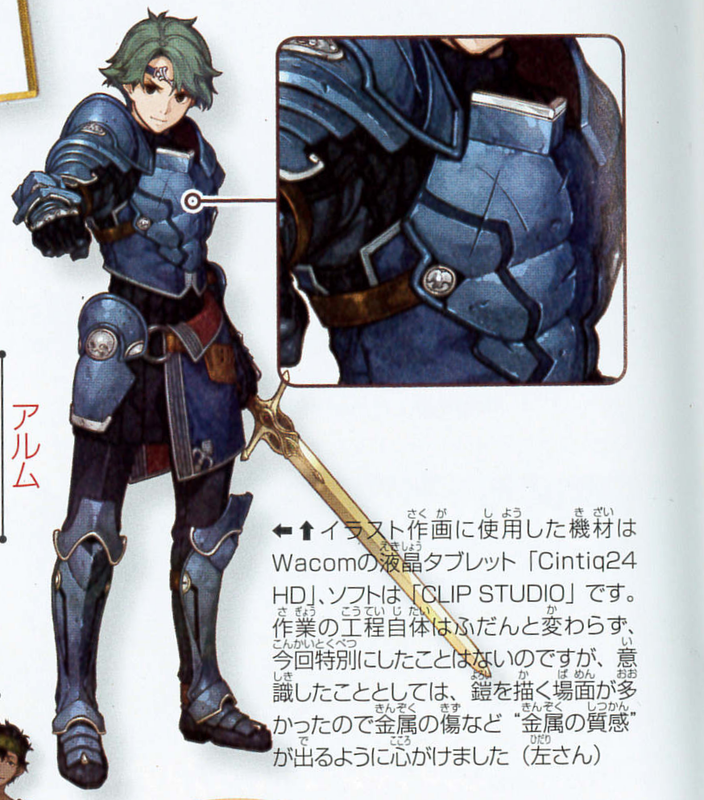 In addition to the large interview on Fire Emblem Echoes; Shadows of Valentia featured in Nintendo Dream’s July 2017 (released May 2017) issue, there was a section with Hidari (character designer) and his comments on some of the various aspects of character design of the game. You can also learn more about the illustrator himself. There is also some concept art shown here and there. This took me some time to scan, edit, and translate (not to mention buying the magazine), so if you’re feeling generous, please feel free to leave a donation! In this corner of the magazine, we ask questions to the artists who breathe life into the characters of the game! Today, Mr. Hidari, a character designer with a varied portfolio spreading across light novels, anime, and games appears! 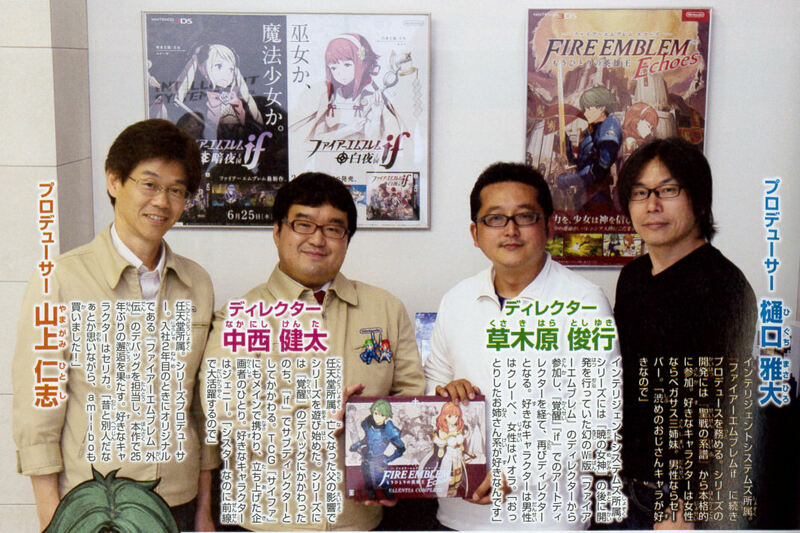 He is the designer behind Fire Emblem Echoes: Shadows of Valentia (from here on, just Echoes). Freelance Illustrator. Illustrator behind novels like Usotsuki Mii-kun to Kowareta Maa-chan*, and anime like Fractale, Natsuiro Kiseki**, and Room Mate. He handled a wide range of character designs for three games in the Atelier Ayesha (Dusk) series. When did you start drawing illustrations? I always liked drawing pictures since I was a kid. While my friends would draw people like Goku and Vegeta (*1), I would usually be drawing weapons, dungeons, logos, and other inorganic things. I fell in love with manga in middle school. Through imitating other artists, I came to be able to draw people much more naturally, too. I think the biggest turning point in terms of drawing people for me came with the advent of CG. From age 20 I was able to start coloring my pictures, and so began to pay more attention to all the intricacies of coloring. How did you come up with the various character poses? The poses had to be something that could express the characters in a suitable way, but since there were quite a few characters, I had to come up with quite a variety of poses to avoid them becoming dull or repetitive. 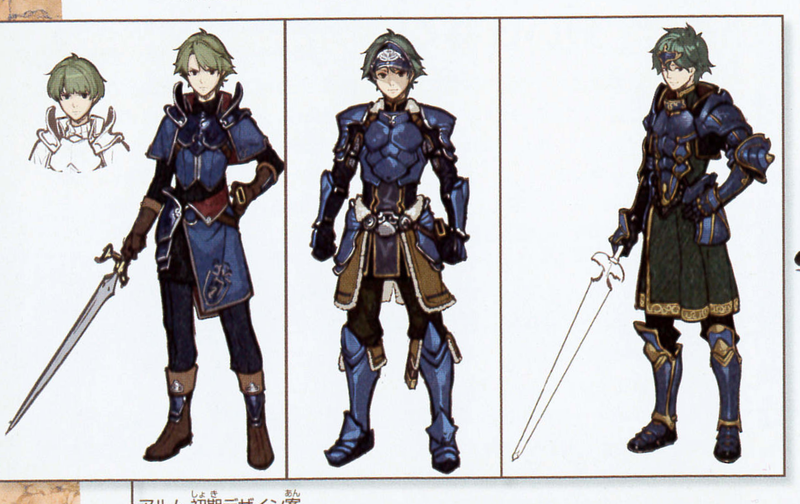 In Awakening and Fates, the designer Mr. Yusuke Kozaki’s (*2) characters were shown from all sorts of angles, such as back view or sitting down. Seeing them drawn that way, I realized that he set a precedent that I too could get away with doing! What was your aim with Echoes? Well, as a whole it was designed as a remake, so I sought to retain the air of a “good old fantasy” while also aiming to appeal and be acceptable to today’s players. I had to actively strive to maintain a balance between the two. Regarding the clothes, there were already different types of established outfits for each class. So I arranged for each of the characters to wear clothes based on these designs. When it came to these designs, I carefully designed it as not to be too overly complex. Other games have such gorgeous or showy characters, and so their designs often call for being rather dense. Things like this have been drilled into my very nature, but since this was a remake, I tried not to add an excessive amount of accessories… despite that they still came out a little more complex than before. When thinking of armor designs, I often reference familiar things as a motif. It’s hard to put in words exactly, but things like a [Japanese] sliding screen, a gutter, a steel rack or pillar, etc. What do you think is the most important part of making a character? It’s a bit of a vague answer, but I would say “charm.” I personally don’t think I’m that good with enchantingly flashy designs, so I have to rely on gestures and facial expressions to bring out a character’s “charm” instead. TN: The word he used was actually “艶” (tsuya), which means many things. Glossy, charm, youthful, feeling, etc. You get the idea. Seven short questions directly to the Character God! 1 What was the first human [shaped] thing you drew? 2 What other illustrators or manga artists do you lie? Masters Jun Suemi (*4) and Hiroaki Samura (*5). Master Suemi influenced my coloring style, and Master Samura my drawing style. 3 What characters do you like? In Echoes, I’d say the simple characters Gray and Robin. They are childhood friends now fighting a war together as comrades in arms with different degrees of confidence. The way Kliff contrasts with the two in his own growth is also great, I thought. 4 What’s your favorite game of all time? There’s no way I can name just one! 5 What games have you been playing lately? As I answer this question, Echoes has just been released, so I’m in the midst of playing that at the moment. 6 What if you were not in this line of work? I’m not exactly sure, but I do have an interest in music. So if I was unable to live up to my dream [of being an illustrator], I’d probably be doing something in music. 7 Tell us something that has impressed you lately. Glasses-free 3D on the 3DS screen! (I’m a little late, since I bought a 3DS just for Echoes). *1: Characters that appear Akira Toriyama’s manga Dragonball. Goku is the main character. *2: A manga artist, illustrator, and character designer with an extensive portfolio. He worked as character designer on games such as No More Heroes, and anime such as BBK/BRNK. *3: Transforming robot toys from TOMY, which became a comic and animated show. Decepticon is the name of the group of antagonists. *4: An illustrator. Did illustrations for the Guin Saga novel series, as well as the Wizardry series. *5: A manga artist. Best known for Blade of the Immortal. That ends Hidari’s segment! I hope you enjoyed and learned something new about the artist. I spent the whole last week translating an interview about Fire Emblem Echoes: Shadows of Valentia. It was featured in the July 2017 issue of Nintendo Dream (released May 20th, 2017). I had to find and buy the magazine too! This post is the entire interview in one place for your convenience (you may notice the last few days have snippets from it, separating various sections). A big thanks to VincentASM on serenesforest.net for referring me to the fact that nobody had translated it yet (that we know of). Please link back if you use any part of the interview as I put a lot of time into it. The original Japanese transcript I (re)typed up is available by request. I recommend reading a previous interview about this game as some things the devs said in it are referenced. Please note the third section has spoilers. The section has a clearly marked spoiler warning from the magazine and me, so please be weary. Lastly, this interview took countless hours of valuable free time to transcribe/translate/edit… not to mention I had to buy the magazine itself. But I’m glad to have had the opportunity to bring this all to you! If you’re feeling generous and want to help support my passion of translating, please use the button below! I translated the entire Famitsu review for Fire Emblem Echoes: Shadows of Valenta (Echoes: Another Hero King in Japan). It received an overall 37/40 rating from four reviewers. The break down was 9/9/10/9. I post a translated image, but the transcript can be found after for reference. 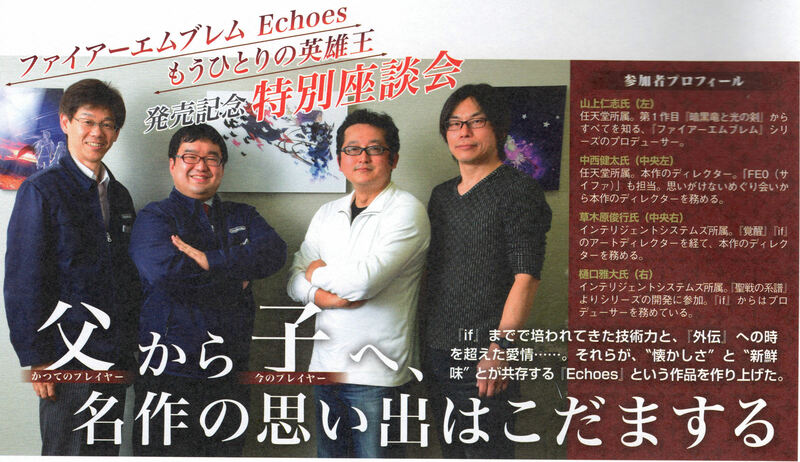 It is from the April 13 2017 issue of Famitsu. A big thank you to VincentASM of serenesforest for providing the review scan! Look forward to serenesforest’s own view on the review and other info gained before the game releases next week. 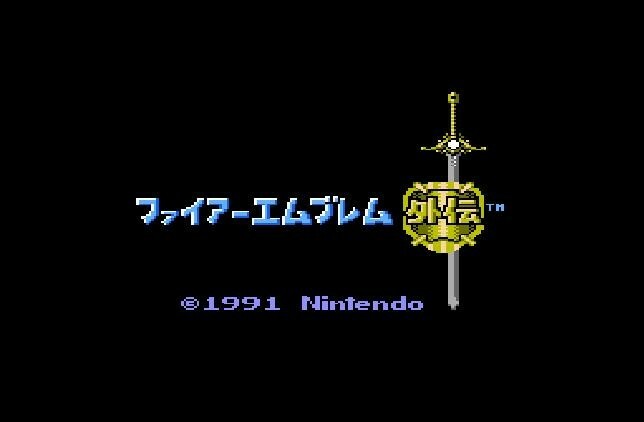 A user named Hardin on serenesforest.net passed a small interview found in an old guide for Fire Emblem: Gaiden to me to translate in celebration of the game’s 25th anniversary in March. 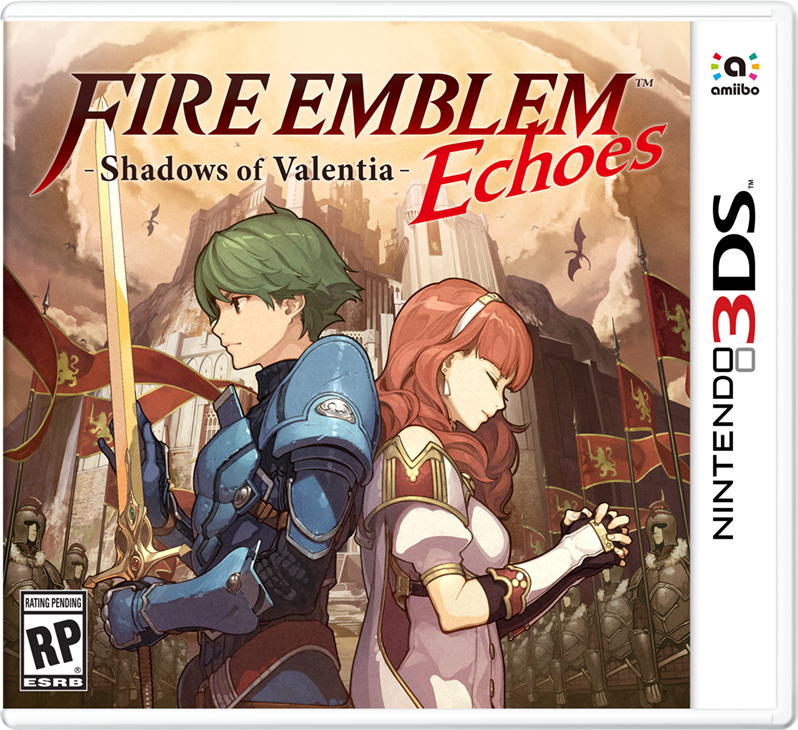 Since then, news of Fire Emblem Echoes: Shadows of Valentia came to light, making this more relevant to readers who may be curious. This article was actually written January 19th, soon after the news of the game was released. (Posting was delayed because I wanted Hardin to post it first, as intended, in March). This portfolio-blog is practically a Fire Emblem blog as well. So here are some brief thoughts and musings I have on the direct that went live today. See it above (that is specifically for North America. I provide Japan and UK below). I had been iffy about remaking Fire Emblem games, though it’s nothing new, considering Shadow Dragon and Heroes of Light and Shadow are both remakes of older games. It was mostly the new trend in FE games (avatar, marriage, children) that had me worried that it may be forced into previous games, so I was hoping they would shy away from doing this to the older games. But, so far, this was a pleasant surprise. Poised to be a full-on remake of Fire Emblem: Gaiden. The narration implies that it will be staying true to what made Gaiden what it is. It was nice seeing a new artist on board, too. The character designs are notably different than Yusuke Kozaki’s art for Awakening and Fates. This time we have “Hidari” (meaning left side, or in her case, left handed) which should bring a fresh approach to characters and their looks, even if these characters will be based on previous designs. So, I hope the children and marriage mechanic is not forced into it, and that it truly is a remake in all forms. Avatar is another issue that should be kept out, considering the focus on the two characters. Even FE12 had an avatar added with mixed response, so let’s see if they learn from that. It is worth noting that Gaiden featured a lack of weapon durability which Fates followed after. I suppose it is fitting they use similar engines. Another pleasant surprise is the localization aspect. For once, the NA/PAL release seems to be just about a month after the Japanese one. Usually the wait is 6+ months for NA and sometimes even longer for the PAL regions. There are mentions of DLC. Some wonder how that may work for a remake of a game, but let’s not forget that Heroes of Light and Shadow (FE12) was a remake that featured DLC episodes to expand on the newer side stories (involving Katarina and co). So that is nothing new. It should be interesting to see what they expand upon in this game! It’s also interesting to note that there is a special edition that you can get all the bonuses without the game itself, also priced at 6980 yen (~60 USD). I would love to get this mainly to translate the artbook for fans! All in all, it’s looking good, and the poll I created on twitter so far has most people excited for this one. It makes sense, as we know quite a bit about it now. Lastly, a remark on the title. If it is Fire Emblem Echoes, does that mean there will be other remakes? 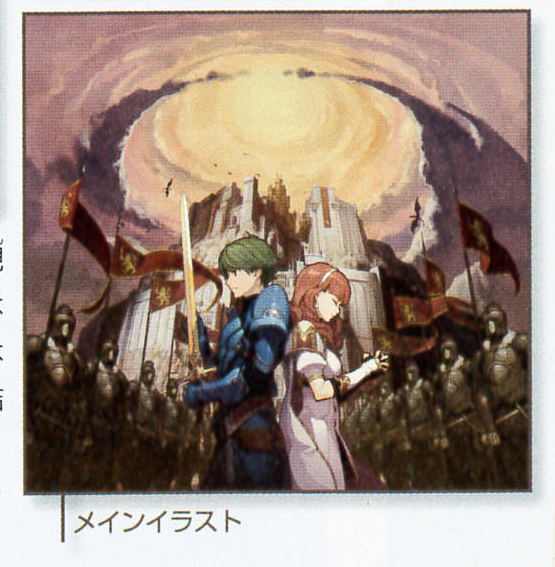 “Shadows of Valentia” is a subtitle after all. So it is a point to ponder. If so, what would be next? FE4 is the game that could actually work properly with children, considering it actually had a system that implemented them quite well without being forced, considering the story revolved around it. A lot of people I know wanted a “console” release for the game, so here it is. As they said, a whole new game for the Switch marks Fire Emblem‘s return to the home console. Not much was given beyond that, as it is said to be far away. FE9/10 were quite wonderful as final console games, so whether or not this will be as epic remains to be seen. I look forward to seeing the character designer and setting for the story, and hope it will be more classical than the recent games have been. This was announced last week at the Switch conference, and we get a slightly better look at Chrom tearing up a crowd of enemies, as expected of the Warriors series of games. There was still not much more said about it beyond that, however. Personally, I am not a fan of the Warriors games so cannot comment on it too much. I am familiar with the character selection variety and gameplay as shown in Hyrule Warriors. But the issue comes down to who will get chosen and who will not. After all, there is such a variety in Fire Emblem games when it comes to characters compared to the Zelda games. It will be interesting to see how they tackle this challenge. Releasing on New 3DS is a fun choice to have, too. It remains to be seen whether there will be differences or not. We finally get to see the mobile game, and, as many fans expected (and some feared), it does seem to be a gacha -like game. Collectors like me are in trouble! It is the nearest to release of announcements that were given, so the most information is available on it. The pre-register is even live today for Google Play. It seems to have a story to it too, but will likely involve a lot of dimension hopping with how summoning works and all that. Whether the story will be an in-depth one or not remains to be seen. The gameplay does seem more simplified, and so far seems free. The money will likely come from the micro-transactions involved in collecting all these characters. Speaking of characters, the main website has several characters already shown with their artwork. Four new characters appear, with series “mascot” Anna as another character who seems to have an important role in the game. It makes sense considering it is a series’ mash-up. Alfonse, Sharena (seems to be シャロン Sharon in Japanese), Veronica, and “The Mysterious Man” seem to be the new characters to the game. All have designs reminiscent of the latest games in the series, which will probably be appealing to those who are fans of the design/designer. Alfonse and Sharena seem to lean toward “good” in their descriptions, with Veronica leaning the other way. The Mysterious Man will likely be a wildcard relevant to the story, mostly. Whether it is a character from the past or not is probably part of the mystery. Marth, Tiki (young), Roy, Lyn, Lucina, Robin (male), and Takumi are some of the others shown (poor FE8 gets shafted here again when it comes to introductions). Though, Eirika is shown on the large display artwork at the top of the website (and shown below on this blog), so I’m sure these are just some introductory characters. 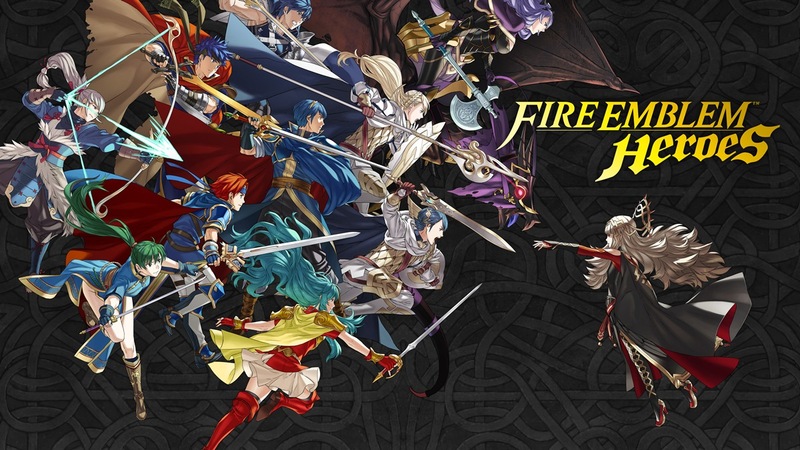 It’s notable that in the trailer, primarily Awakening and Fates characters were shown. Probably due to being the characters a large part of the fanbase (both old and new) would recognize as opposed to older characters. Voting is currently underway as of this writing. Vote for who you want to see in the game. Take a wild guess who I picked for Day 1. Lastly, officially localized names are provided for characters who were unclear before. A list will come soon! Curiously, Blazing Sword is now Blazing Blade. I guess it works with Binding Blade … so that’s pretty cool. So the game should be interesting. It will likely have multiple language options, as the main website itself does and the game sees to a worldwide release. So there is something for everyone in there indeed! So what are your thoughts on these four games? Hopes? Expectations? Disappointments? I would love to hear your thoughts. I kept mine as brief as I could! I will keep an eye on the weekly Famitsu to see if any more FE info will be coming along the way and hope to translate those like I used to. 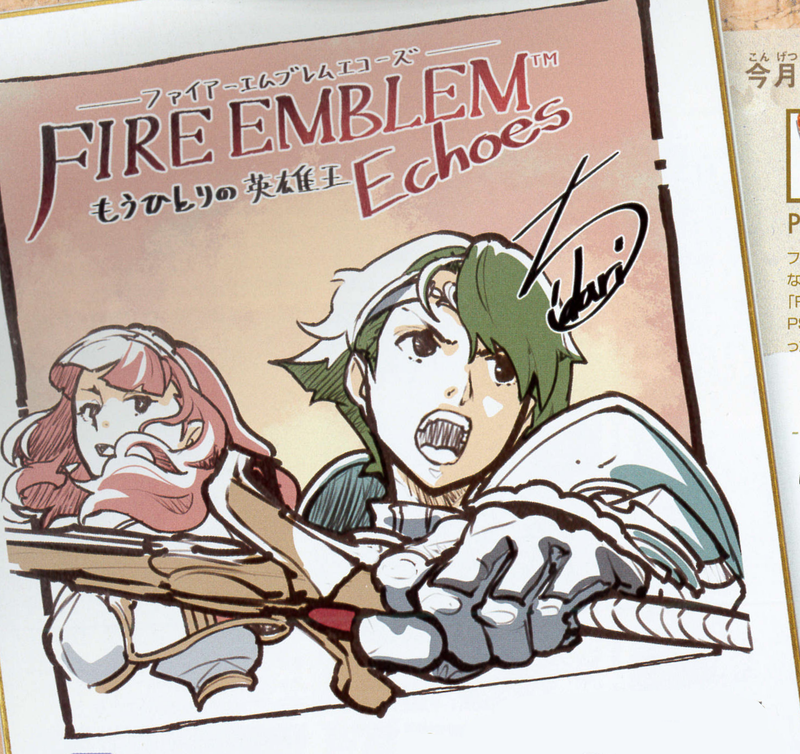 Likewise, I will see into raising donations to get a copy of the Special Edition for Echoes in order to translate the design book!